Every summer, the Real Madrid Foundation offers soccer camp places to boys and girls aged between 9 and 17 years of age. Participants can spend their summer break playing soccer, meeting like-minded youngsters from around the world, and enjoying range of activities and excursions organized by the Foundation's team of professionals. The camp provides a combination of soccer training programs and 'experience activities' to ensure that each student has a summer they will never forget. For players or goalkeepers of all abilities. Coaching takes place in Valdebebas and participants stay in the Erasmo de Rotterdam residence. For federated players or goalkeepers. The coaching takes place at the Villaviciosa de Odon sports complex and participants stay at the residence of the Universidad Europea de Madrid. My son is so happy to have participated in the Real Madrid soccer camp. It was well directed by qualified instructors. He enjoyed himself a lot. Thanks to the Real Madrid team. For me, the Real Madrid training is very professional and efficient. Good progress at a technical level. The double rooms are very comfortable with air conditioning and WIFI, since it gets very hot in Madrid (38°C). The instructors are very friendly and open. Videos of customer experiences Soccer Camp. All training is carried out by specially-selected team from the Real Madrid Foundation. The training sessions are split into two sessions with 90 minutes in the morning and another 60 minutes in the afternoon. There are two specific training programs at the Real Madrid Foundation Campus Experience: Standard and technical. Each program involves training schemes suited to the level and ability of the children. However, children who take part in the technical program must be affiliated to a local team. The standard programme takes place at Valdebebas Football Centre while the technical programme is held at the Villaviciosa complex as well as at the sports facilities of the Universidad Europea de Madrid. In addition, children will take part in is a series of activities scheduled throughout the rest of the day known as the “Experience.” These endeavours can vary depending on the date and time and are organized with the intention of developing and motivating the youngsters, while ensuring that they enjoy themselves to the fullest during their stay. The language courses are overseen by prestigious language institutions - the English classes come under the direction of the British Council, while the Choices International is in charge of the Spanish classes. As well as offering a wonderful international setting, with young people from more than 90 different nationalities, the camp offers, through its language study, a unique opportunity for students to practise their English or Spanish and make friends from all over the world. The British Council and Choices International are language schools with many years’ of experience managing language courses. They employ staff dedicated to teaching languages to adults and young people. The teachers deliver lessons based on a football theme and on the interests of the students themselves. At the summer camp, students receive 5 English or Spanish classes per week, from Monday to Friday. The maximum number of students per class is 15 and each group comprises learners of similar ability. The language courses take place at the student residence which is the accommodation used by camp participants. The classes take place in study rooms which are fully equipped for this purpose. The English (or Spanish) teachers use a very participative methodology which is fun and engaging for the students and gives them ample opportunity to develop their speaking skills. Examples of teaching methodologies used in the English (or Spanish) classes are: situational role plays, pair and group working, all situations designed to encourage student participation. These activities may involve 60, 90 and 120-minute sessions spread across the campus training days. They may take place in the morning or afternoon, or sometimes both. The content of the sessions will depend on the chosen camp format and which residence the students are staying in. The “Campus Experience” sessions deal with tactics, strategies and the theoretical and technical concepts of soccer. In addition, students learn the values of hard work and camaraderie. They will also explore the roles of lifestyle, healthy eating and motivation in the life of an athlete. These sports-related activities take full advantage of the fantastic facilities on offer such as the swimming pools. 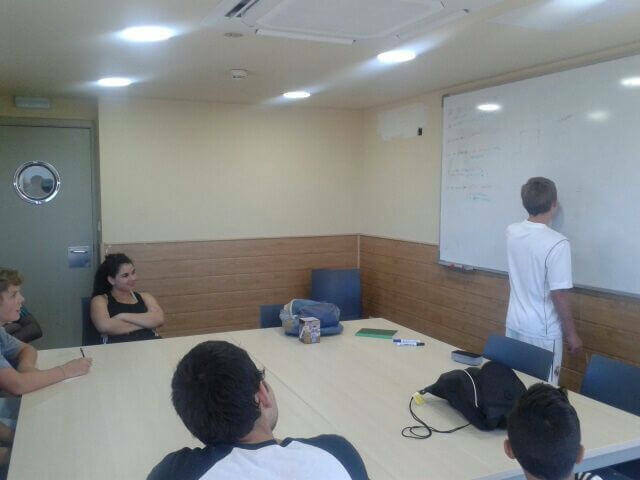 The students in each group will rotate through the different activities as part of their daily schedule, giving them the opportunity to get better acquainted. Parents can also enjoy gatherings with their children in the residence halls and tutorials with the trainers later on in the day. The accommodation for the standard football camp is located in the Erasmo Residence at the Autonomous University of Madrid. All rooms are double and have their own bathrooms, a telephone, air conditioning and internet access. The children also have use of the other facilities at the residence including the relaxation room (with television and DVD player), games rooms, study rooms, cafeteria and laundry. The centre is also equipped with night-time surveillance. Training sessions are held in Valdebebas where the extensive facilities include 12 football pitches (of natural and artificial turf), changing rooms, medical centre and a cafeteria. Students who attend the technical football program will stay in the Residences of the European University of Madrid, situated in Villaviciosa de Odón. The accommodation is equipped with all modern conveniences including a library, study room, games room, computer room and theatre. The students stay in double rooms that benefit from air conditioning and fabulous views of the University's exterior gardens. They will also be able to enjoy the fantastic swimming pool in their free time. Training sessions for the technical camp are held at the Municipal Pitches of Villaviciosa de Odón, and at the facilities of the European University of Madrid. The residence halls are closed premises that maintain their own security 24 hours a day. At night, the children are under the supervision of the camp monitors who also spend the night in the same facilities. Each course also has a director who provides a point of contact for the parents of the students. These courses are subject to a registration fee of 154€. The official rate of this camp is determined in EUROS, so the final amount in US DOLLARS may vary slightly due to the fluctuation of both currencies. Outside the standard established times for arrivals and departures, the transfers service will incur an additional cost of 75€ per journey. * Your price quote will contain the standard transfer cost. Once we confirm the dates the price will be adjusted accordingly.